Happy Monday! It has definitely NOT been a warm summer here all year and now it is blazing and humid almost every day this week. Thankfully, it was a bit cooler on Sunday, so I just threw on some jeans and a tunic. I saw this tunic and had been eyeing it for a while, and then Anthro had a sale! This is the comfiest and one of the prettiest tunics I own and I love that it will transition into Fall. I added my favorite denim and some metallic flats (which are a recent buy)! 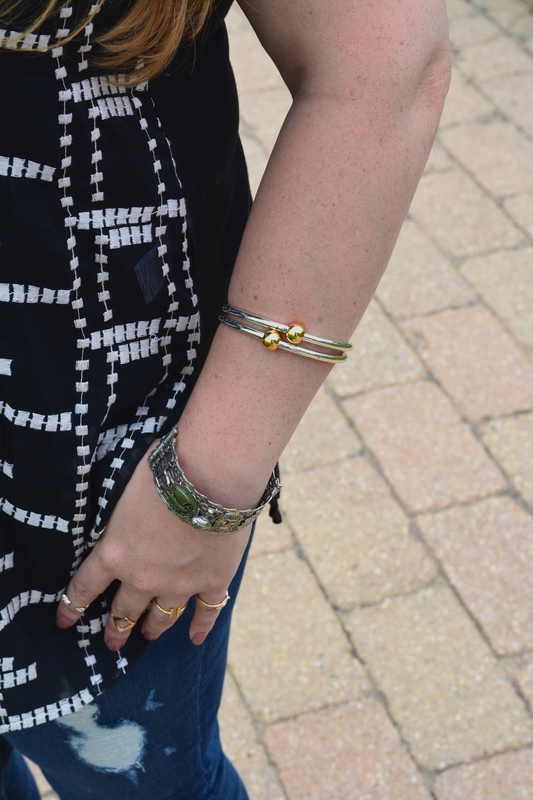 I also added some vintage jewelry, as this tunic gave me the vintage and boho vibes. I was going to link this hat at the bottom and as I was browsing the hats, I saw some for $69 and $129 on the Forever 21 website! I LOL’ed a bit, mainly because I would never spend that much on a hat, EVER, especially from there. Anyways, have a lovely Monday! Your top is so fun! I love the print! very cool summer look! Such a lovely outfit, Denise! You made a good matching up here. And the hat.. yes, thumbs up for it! Lovely tunic! It will be great for fall. 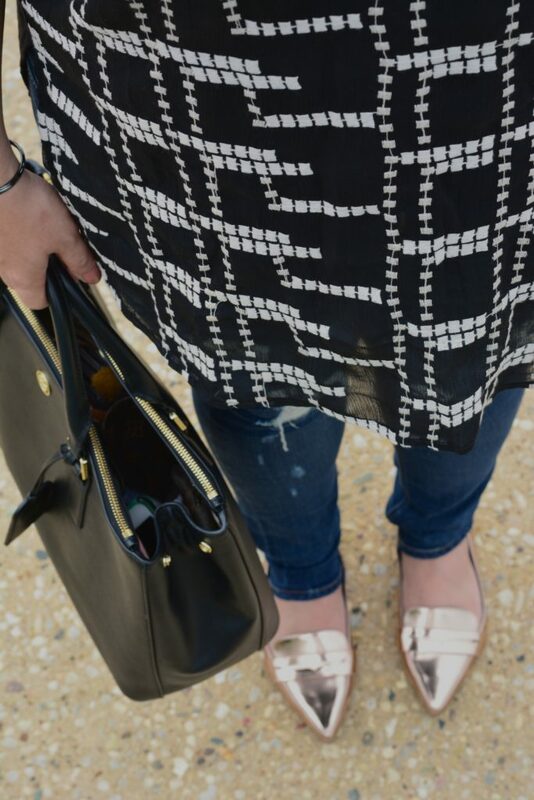 I like your metallic flats with it! Adore this look! Those shoes are everything! Your blog is always such a joy to read. I love how you accessorize! The top is beautiful and so are your pictures! I love this so very much! Those shoes are to die for! I LOVE this embroidered tunic! 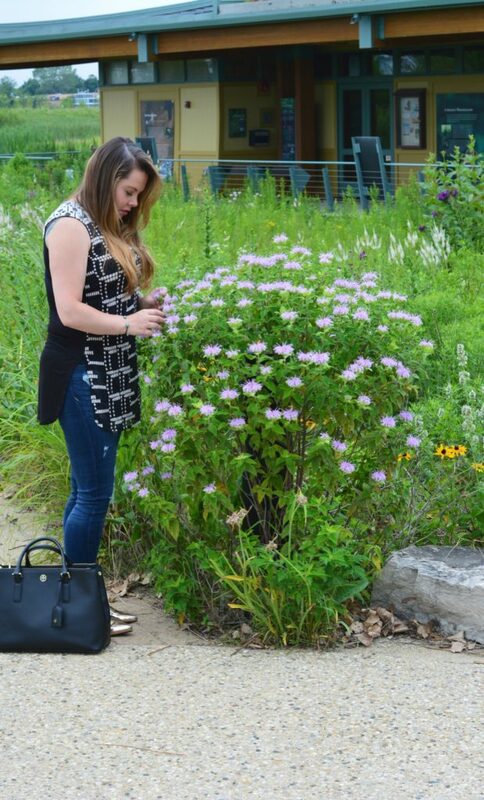 I have been obsessing over anything embroidered this summer and this tunic is just the cutest! Fabulous flats too, can’t believe they are from F21! Happy Monday! This tunic is so cute! I love the graphic print, and it looks great with your distressed skinny jeans. I love that fun tunic! Those shoes are amazing too! Such a pretty tunic, I love that the pattern is just on one side. I also really love your floppy hat! Fun tunic! Great hat, too! Those flats really take this look to another level! But love the whole look! I really, really, REALLY need to get my hands on a tunic soon, you look fabulous in it! And I agree with you, I would never pay that much for a hat too, that’s just bonkers and I would rather spend that much on a dress. Great tunic, i love the slits on the side that provide a little extra comfort. Such a cute top! I love it, and especially swooning over your bag! This really is a pretty tunic, and that it is longated in the back and front and slit in the sides is too cute, I could live in one of these. Pretty printed top and gold shoes!! Great outfit in general! I love the embroidery work on your tunic! Outstanding! I really like the tunic! Your shoes rock! I’m obsessed with that tunic, Denise! YOU look so pretty!!! Those jeans are so good! Love the entire look, the detail on the blouse is gorgeous. Beautiful tunic. Those dark in color, light and airy in fabric weight. I like that it’s a tiny bit sheer. You look so cute. Those golden flats and that top, are amazing. Which is why I love visiting your space, you know how to dress for your shape and girl you always look chic. Gotta check out those flats. Such a pretty hat! <3 love it! VERY CUTE TUNIC, LOVE THE SHOES. Girl–its been cold here and then our air broke and of course it gets blazing hot this week haha! I love this look on you–tunics are my fav! Beautiful look! I love those pretty little flats! I love everything about this look! 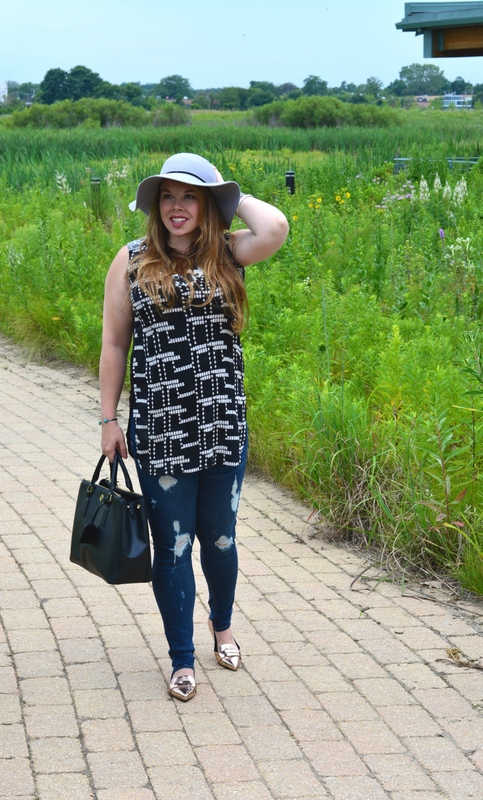 The tunic, the jeans, the flats, the hat! Outfit perfection! 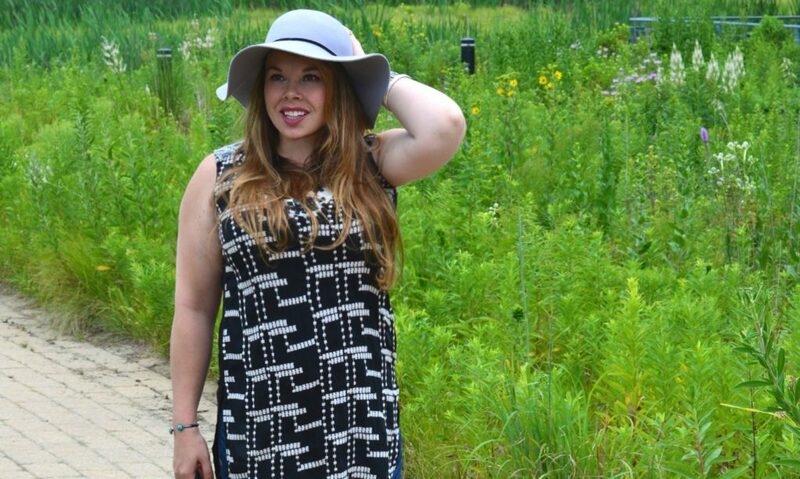 What a pretty tunic and love your hat too! Lovely shoes sweetie!! Also love the bag!! I love items that can easily transition from one season to the next, and your tunic is just perfect for that! What a great look too! PS- $129 for a hat? No thank you! I think the most I’ve spent is $20 haha. Love the pattern of the tunic on you and the hat is fabulous! I know what you mean about heat!! That tunic is so interesting, perfect piece for the summer, I really like those embroidered details on the front.